For the town in Italy with the same name, see Farnese, Lazio. The Farnese family is an influential family in Renaissance Italy. The titles of Duke of Parma and Piacenza and Duke of Castro were held by various members of the family. The family could trace its origins back to around AD 984 and took its name from one of its oldest feudal possessions - Castrum Farneti. There has been some debate as to the origins of the name Farnesi/Farnese. Some suggest that it derives from the vernacular name for an oak found in the region, the Farnia (Quercus robur), but others have held that the name owes its origins to the Fara, a term of Lombard origin used to denote a particular social group. In the 12th century, they are recorded as minor feudataries in the areas of Tuscania and Orvieto, several members holding political positions in the latter commune. One Pietro defeated the Tuscan Ghibellines in 1110 and, most likely, fought against the Italo-Normans in 1134. His son Prudenzio was consul in Orvieto and defeated the Orvieto Ghibellines backed by Siena; another Pietro defended the town against Emperor Henry VI. In 1254, one Ranuccio defeated Todi's troops and fought for Pope Urban IV against Manfred of Sicily. His son Niccolò was in the Guelph army in the Battle of Benevento (1266). The Farnese returned to Tuscia (southern Tuscany-northern Lazio) in 1319, when they acquired Farnese, Ischia di Castro, and the castles of Sala and San Savino. In 1354, Cardinal Albornoz, in return for the family's help in the war against the Papal riotous barons, gave them the territory of Valentano. In this period they fought against the fierce Papal rivals, the Prefetti di Vico. In 1362, Pietro Farnese was commander-in-chief of the Florentine army against Pisa in the war for Volterra. Six years later Niccolò Farnese saved Pope Urban V from the attack of Giovanni di Vico, first in the castle of Viterbo and then in that of Montefiascone. The loyalty to the Papal cause meant that the Farnese were granted confirmation of their possessions in the northern Lazio and given a series of privileges which raised them to the same level as more ancient and powerful Roman barons of the time, such as the Savelli, Orsini, Monaldeschi and Sforza of Santa Fiora. The family substantially increased its power in the course of the 15th century, as their territories reached the southern shore of the Lake Bolsena and Montalto, largely due to Ranuccio the Elder. He was commander-in-chief of the forces of neighbouring Siena against the Orsini of Pitigliano and, after his victory, received the title of Senator of Rome. His son, Gabriele Francesco, also took up a military career, a line of employment which disappeared after three generations. Ranuccio's son, Pier Luigi, married a member of the ancient baronial family of the Caetani (that of Pope Boniface VIII), thus giving the Farnese further importance in Rome. His daughter, Giulia, who was a mistress of Pope Alexander VI, further expanded the Roman fortunes of her family by persuading the Pope to bestow on her brother Alessandro the title of cardinal. Under Alexander's successor, Pope Julius II, he became governor of the Marca Anconetana and, in 1534, he was elected as pope and took the name of Paul III. Notable features of his reign included the establishment of the Council of Trent and an unprecedented level of nepotism. For example, two months after becoming pope in 1534, he made his 14-year-old grandson Alessandro a cardinal deacon. Paul III died in 1549 and his political role in the Curia passed to his grandson Alessandro, who remained an influential cardinal and patron of the arts until his death in 1589. Paul III used his position as pontiff to increase the power and possessions of his family. He gave his illegitimate son, Pier Luigi, the title of gonfaloniere or Gonfalone of the Church. He also gave him the town of Castro with the title of Duke of Castro, granting him possession of lands from the Tyrrhenian Sea to the Lake of Bolsena, as well as the area of Ronciglione and many other smaller fiefdoms. In 1545, Paul handed over, from land once belonging to the Papal States, further territories in northern Italy to his son who took the additional title of the Duke of Parma. Paul thus established his family as an Italian ducal dynasty, a project at which the Borgia Pope Alexander VI had failed. Two years later Pier Luigi was assassinated by his new subjects under a Spanish mandate. Despite intrigues by Charles V, the Pope reacted promptly and soon established Ottavio, Pier Luigi's son, on the ducal throne. He secured this by marrying Ottavio (1547–86) to the eldest illegitimate daughter of Charles V, Margaret. Ottavio was given the additional title of Duke of Piacenza and initially established his court there where work was begun on a huge Farnese palace on the banks of the River Po. 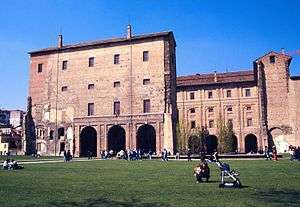 However, during construction, and probably in response to political intrigues by the Piacentine nobility, Ottavio Farnese moved his court to Parma where he had the Palazzo della Pilotta constructed in 1583. In 1580 Ranuccio I was the first in succession line to the Kingdom of Portugal. His great-uncle Henry I of Portugal's death triggered the struggle for the throne of Portugal when Ranuccio was 11 years old. 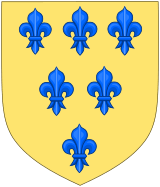 As the son of the late elder daughter of Infante Edward, 4th Duke of Guimarães, the only son of King Manuel I whose legitimate descendants survived at that time, Ranuccio was according to the succession law the first heir to the throne of Portugal. However his father was an ally and even a subject of the Spanish king, another contender, so Ranuccio's rights were not very forcibly claimed. The Farnese court in Parma and Piacenza under Duke Ranuccio II (1630–94) was one of the most splendid in Italy. 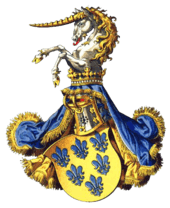 The Duchy of Parma and Piacenza continued to be ruled by the Farnese until the 17th century. But the city of Castro was removed from the Farnese family holdings when the Farnese fell out with the Barberini family of Pope Urban VIII sparking the Wars of Castro. In 1649, the conflict ended when Pope Innocent X had the city razed. The small dukedom eventually fell under the Spanish control and influence; the family lost Parma and Piacenza in 1731 when the last duke, Antonio Farnese, died without direct heirs and his collateral heir, his niece Elizabeth Farnese, Queen of Spain, passed a successful claim on to her sons, Don Carlos (later King Carlos III of Spain) and Filippo House of Bourbon-Parma. d'or à six fleurs de lys d'azur posées 3, 2 et 1.
d'or, à six fleurs de lys d'azur, en deux pals de part et d'autre au pal brochant de gueules, à l’ombrelle à galons d'or, la tige en forme de lance chargée de deux clefs en sautoir avec les pannetons tournés vers l'extérieur et vers le haut, l'une d’or et l'autre d’argent, liées d'azur (qui est le Gonfalon de l'Eglise). écartelé, en 1 et 4 d'or, à six fleurs de lys d'azur posées 3, 2 et 1, en 2 et 4 (Habsburg) parti de gueules à la fasce d'argent (Austria) et bandé d'or et d'azur de six pièces à la bordure de gueules (Burgundy Ancient) ; au pal brochant de gueules, à l’ombrelle à galons d'or, la tige en forme de lance chargée de deux clefs en sautoir avec les pannetons tournés vers l'extérieur et vers le haut, l'une d’or et l'autre d’argent, liées d'azur (qui est le Gonfalon de l'Eglise). 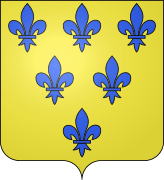 écartelé, en 1 et 4 d'or, à six fleurs de lys d'azur posées 3, 2 et 1, en 2 et 4 parti de gueules à la fasce d'argent et bandé d'or et d'azur de six pièces à la bordure de gueules ; au pal brochant de gueules, à l’ombrelle à galons d'or, la tige en forme de lance chargée de deux clefs en sautoir avec les pannetons tournés vers l'extérieur et vers le haut, l'une d’or et l'autre d’argent, liées d'azur (qui est le Gonfalon de l'Eglise) ; sur le tout d'argent au cinq écus d'azur disposés en croix, chaque écu semé de besants d'argent, à la bordure de gueules chargée d'onze châteaux d'or. 1 2 3 4 Héraldique Européenne : duché de Parme. Annibali, Flaminio Maria (1817–18). Notizie Storiche della Casa Farnese. Montefiascone. Nasalli Rocca, Emilio (1969). I Farnese. dell’Oglio.